Overall, most Muslims in Israel say they adhere to core tenets of their faith. For example, more than three-quarters of Muslims (83%) say they fast during the holy month of Ramadan, and roughly two-thirds say they give zakat (an annual donation of a percentage of one’s wealth to the needy or to a mosque). Christians in Israel also are generally observant of their faith. For example, a large majority say they have received the annual sacrament of holy oil – a ritual closely associated with Orthodox Christianity but also practiced by most Catholics in Israel. The survey did not ask Druze respondents specific questions about their religion beyond their affiliation and overall observance. In general, Druze are known to be reluctant to talk about their religious beliefs and practices. There are several reasons for this: In order to learn more about their community’s spiritual beliefs, Druze have to undergo a formal initiation process that involves several different stages of study. Many Druze may not have undergone initiation and may therefore lack detailed knowledge about their faith. And because of a history of religious persecution, Druze may be reluctant to speak about religion generally. For more background on Druze, see the sidebar later in this chapter. Majorities of younger and older Muslims, men and women and those with different levels of education say they engage in these practices. But Muslim women in Israel are somewhat more likely than Muslim men to say they fast during Ramadan (89% vs. 78%). And younger Muslim adults (ages 18 to 49) are less likely than their elders to fast (81% vs. 91%). Like Muslims, the vast majority of Christians in Israel observe at least a few key aspects of their faith. The overwhelming majority of Christians in Israel (94%) say they have been baptized. Majorities also say they have icons of saints or other holy figures in their home (81%) and that they have been anointed with holy oil (83%) – a ritual performed annually or in case of illness. Tithing – that is, giving a set percentage of one’s income to their church – is less common among Christians. Overall, 39% of Christians in Israel say they tithe. Orthodox Christians and Catholics – the two most prominent Christian subgroups in Israel – are about equally likely to engage in these rituals. For example, 37% of Orthodox Christians and 34% of Catholics say they tithe. 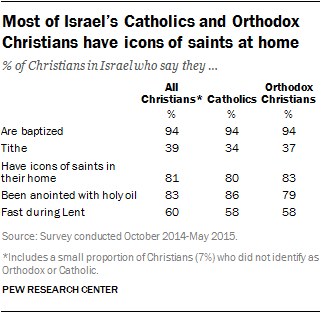 And even though receiving the sacrament of holy oil is most closely associated with Orthodox Christianity, most Catholics in Israel (86%) also say they have participated in this practice. 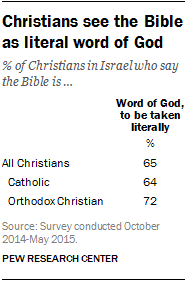 A majority of Israeli Christians (89%), including most Orthodox Christians and Catholics, say the Bible is the word of God. This includes 65% who say the Bible should be taken literally, word for word. Catholics also were asked how often they go to confession. Roughly three-in-ten Israeli Catholics say they go to confession at least once or twice a year. But a majority (68%) say they seldom or never go to confession. 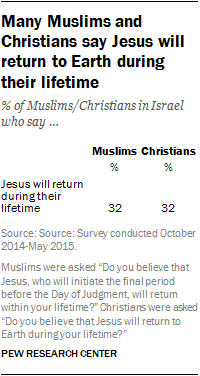 The survey asked Muslims and Christians if they believe Jesus will return to Earth during their lifetimes. Although Muhammad is regarded as the final prophet in Islam, Muslims also consider Jesus a prophet, and 32% of Muslims in Israel say they believe Jesus will return to Earth during their lifetimes. A bigger share (49%) say they do not believe this will happen, while 18% say they don’t know or do not have an opinion on the issue. Christians are divided among those who say Jesus will return during their lifetimes (32%), those who disagree with this view (37%) and those who do not have a clear opinion either way (31%). 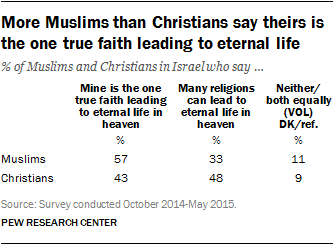 Overall, Muslims in Israel are more likely than Christians to say theirs is the one true faith leading to eternal life in heaven. A majority of Muslims say this (57%), while one-third (33%) say many religions can lead to eternal life. By comparison, Israeli Christians are about evenly divided between those who see their faith as the one true religion (43%) and those who believe many faiths can lead to eternal life (48%). Orthodox Christians are about as likely as Catholics to say theirs is the one true faith leading to eternal life in heaven; roughly four-in-ten adults in both denominations take this view. Roughly 131,400 Israeli citizens belong to an ethnoreligious group called the Druze.20 Originally founded by a Shia Muslim mystic in the 11th century, the Druze have grown to a close-knit community of more than a million followers, largely concentrated in Syria, Lebanon, Jordan and Israel. There also is a significant diaspora community in the U.S., Latin America and elsewhere. In Israel, Druze men serve in the military and Druze are active in public life.21 Most Druze in Israel live in the northern regions of the Galilee, Carmel and the Golan Heights. The Druze are monotheistic and place heavy emphasis on philosophy and spiritual purity. Several years after the founding of the Druze tradition, and after a series of conflicts with the Fatimid Caliphate in Egypt, the Druze tradition was officially closed off to outsiders and proselytism was prohibited. Since that ban, the Druze population has continued to exist solely based on the continuation of its previous generations. Because Druze do not allow conversion or intermarriage, today they form a distinct ethnic as well as religious group. There are two main spiritual “levels” for the Druze: the uninitiated and the initiated (or al-Uqqal, meaning the “knowers”). Initiation is a voluntary process through which a select group of Druze go through several stages of learning about the spiritual beliefs and practices of their community. Leaders of the Druze community (e.g., judges in religious courts and representatives on religious councils) are primarily from al-Uqqal and are known as ajawid, or religious leaders. Druze houses of prayer are called khalwaat. However, there are no set holy days, regular liturgy or obligations for pilgrimage, as Druze are supposed to be connected with God at all times. Druze also believe in reincarnation of the soul. Followers who attain a high level of spiritual purity are said to experience tajalli, an encounter with the divine. Other tenets of the faith include truthfulness, fellowship, abandoning false beliefs, purification, accepting the unity of God and submitting to the will of God. There are also dietary and health guidelines; for example, Druze are not permitted to eat pork, drink alcohol or smoke tobacco. The Druze believe in several “mentors” and “prophets,” including Jethro of Midian (the father-in-law of Moses), Moses, Jesus, John the Baptist and the Prophet Muhammad. Several philosophers and other influential people are also held in high regard by the Druze, including Socrates, Plato, Aristotle and Alexander the Great.